It will come as no surprise to you that summer in Italy is hot. Before we headed off on our travels to Rome, I was debating what to pack, and the answer is - practical things. Rome was so incredibly hot, with temperatures reaching up to 40C at the peak of the day in July/August. When you are out exploring there's often not much shade to keep cool or step out of the sun, so you need to be realistic in what you're wearing. Although Italy might be one of the most famous fashion countries of the world, there's only so much you can do when you're visiting as a tourist in regards to your personal style. The key is to take layered pieces for when it cools in the evening, or visiting holy sites - you will need a small cover up. Shorts and strappy tops will become your best friend, offering a comfortable approach and keeping you comfortable all day. Make sure you take some good walking shoes, I cannot stress this enough. I'm the worst for only buying 'fashion' shoes, and although these sandals were comfortable and let my feet breathe, nothing can prepare you for just how much you feet will ache regardless after a long day of exploring. It's important to take a range of shoes that you can change into for when your feet get too hot, or something that will go with a whole host of outfits. The main thing is that you're cool and comfortable against the heat. There's nothing wrong with a good old sun hat either! And of course, don't forget you sunglasses and sun cream. 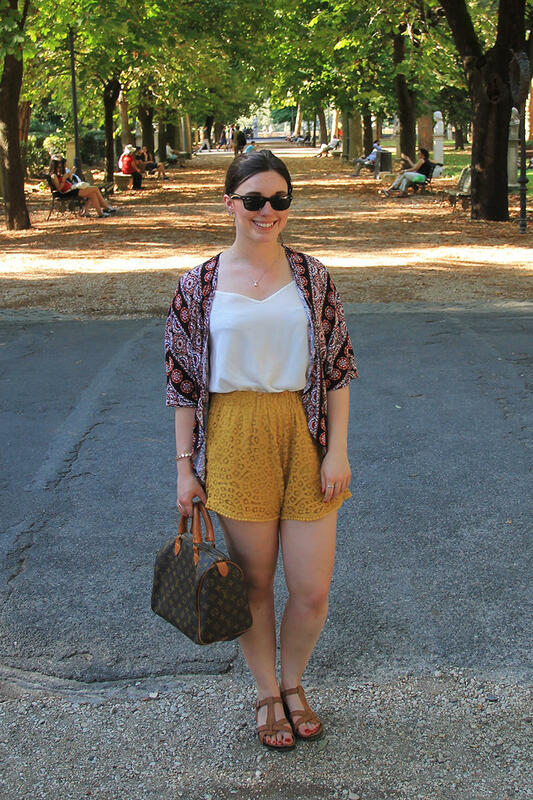 This is something I wore on our first day in Rome, it was so nice to get into some sunshine and away from our not so great Scottish weather at the time. I had a bit of a shopping spree before hand as I hadn't been on holiday in the past two years so my summer wardrobe was in need of a refresh. A lot of pieces I bought in H&M including these shorts which were super comfortable to wear on holiday, and I loved their sunny bright colour and subtle crochet detailing. Paired with my light jacket from Primark, adding a 70s vibe. I only took two pairs of sandals on holiday with me as I was travelling with hand luggage only so these sandals from TK Maxx were my saviour with all the walking we did!